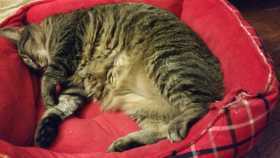 Sweet, male grey tabby. A little chubby, but he's lost weight lately so he has some loose skin. He's wearing a yellowish green safety collar.